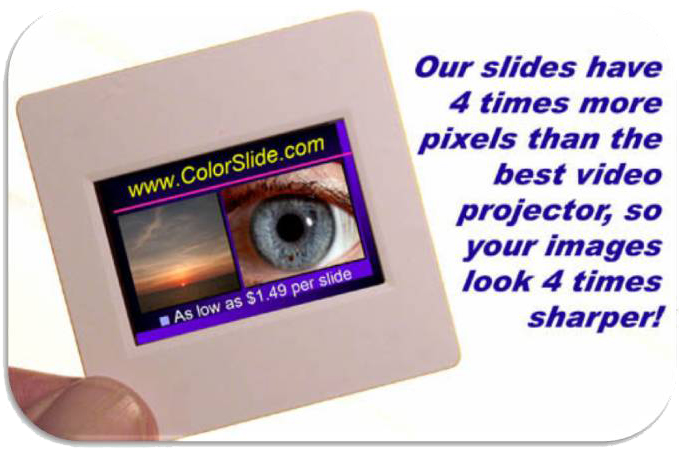 Color Slides from Your Digital Images are produced at ColorSlide.com! 35mm color slides made from your digital images. NEW! 4 day turnaround time with Priority RUSH Service! Color Slides from your digital files is what we do. We produce brilliant 35mm color slides from your Digital Camera Images, Adobe Photoshop files, Artwork photos, gobo light templates, scanned images and Microsoft PowerPoint. Preserve your best digital camera images forever by having them made into easy to store 35mm color slides! Our clients include discriminating artists, photographers and business professionals who use our 35mm color slides for important juried shows, art competitions, Advanced Placement Art Classes, college applications, college classes, DIY ViewMaster Reels, movie theater advertisements, gobo lights, Unique Lamp Shades and their business presentation needs. The preservation of your artwork forever is possible with our slides and it’s one of our goals. View the how to video. 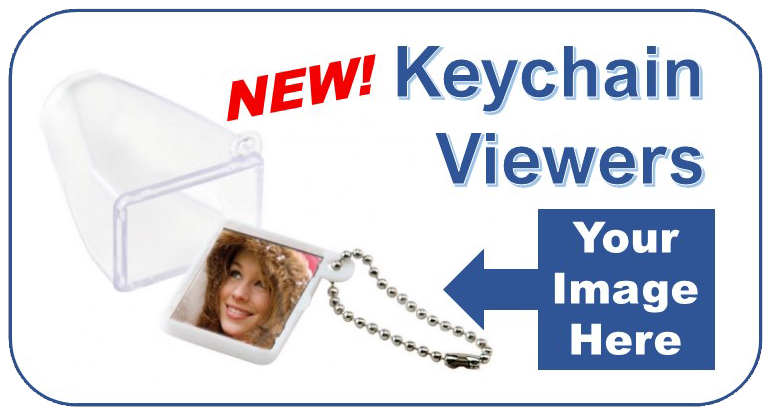 New custom made Keychain Viewers are now available! I just received the slides and they look fantastic — If you ever need a testimonial for your site — I’d be happy to oblige! Thanks for the prompt delivery of really great slides! I want to thank you for the slides that you sent to us, they’re perfect! It’s so nice to know that you can go online and find someone who does what they said they would do when they said they would do it. The next time we need slides we’ll be contacting you! Industry standard 2×2 inch 35mm color slides. Fit in Kodak Carousel Trays holding 80 or 140 slides, plus other brands of 35mm slide trays. We use Fuji Velvia 100 film. Printed at 2732×4096 pixels at 372 dpi to a film recorder. Mounted in plain plastic slide mounts with white on both sides. No numbers, dates or logos are used on the slide mounts. Your slides are shipped back to you in clear plastic slide pages. The space for your image is the pixel dimensions mentioned above. If your image measures less pixels, it will automatically be printed to fit as large as possible within the viewing area of the slide and any remaining space will be filled with black. Like us on Facebook for a 20% discount!